Holtec UMAX lid. Lower and upper lid have air vents for convection cooling. 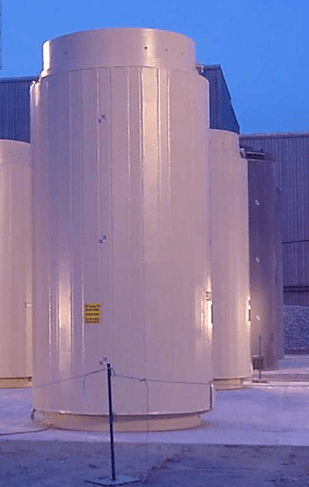 Holtec HI-STORM UMAX canister storage systems and all other thin-wall nuclear waste canister storage systems are vulnerable to short-term cracking, radioactive leaks and potential explosions and criticalities. Each canister has roughly as much highly radioactive Cesium-137 as was released from the 1986 Chernobyl nuclear disaster. No plan for failing canisters. Holtec Umax lids at San Onofre nuclear waste facility. Under each lid is a 37-fuel assembly thin-wall (5/8″ thick) canister (MPC-37). Radioactivity at air vent (e.g., carbon-14) measured 324 CPMs (0.97 microsieverts/hour) using Safecast bGeigie Nano. Photo from Gene Stone and Darin McClure. Instead of the Nuclear Regulatory Commission (NRC) requiring minimum standards and only approving superior thick-wall storage casks that meet critical safety requirements, they continue to approve the inferior thin-wall canisters. Holtec proposes to transport thousands of US aging nuclear waste cans across the country to New Mexico and store them in an unproven HI-STORM UMAX canister storage system. See NRC Holtec CIS website for technical documents and other related information for the CIS New Mexico site. 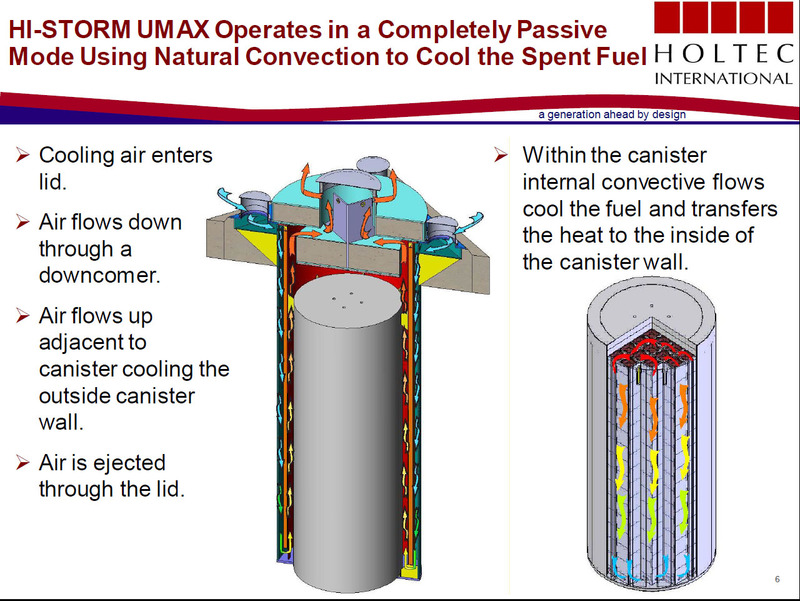 More details about the HI-STORM UMAX canister storage system (currently used at San Onofre and Callaway) are addressed below. Photo below shows rust already starting on Holtec lids at San Onofre. Metal sprays are to keep seagulls from pooping on the lids. Works must continue to clean the lids, getting radiation doses while they work. Square part of lid has inlet air vents near the corners. Upper round lid is outlet air vent. Rain, fog and debris enters through air vents. There is no drain in the bottom of the hole for any of it to escape. NRC doesn’t require inspection inside the holes unless the canister is overheating. Initial Holtec plan called for double-stacking two canisters in each hole in the ground using the HI-STORM CIS dry storage system. However, the April 25, 2018 NRC CISF slides indicate one canister in each storage module. Holtec’s application (ML17115a418) for the Holtec CIS site states they will use the Holtec UMAX dry storage system already approved by the NRC HI-STORM UMAX canister storage system (docket # 72-1040). Details of the NRC HI-STORM UMAX canister storage system are addressed on this webpage below. Is there a Holtec future plan to use deeper holes and request a HI-STORM CIS license or UMAX license amendment to store two cans in each hole? This January 2013 Holtec slide shows deeper holes for stacking two canisters in each hole: Holtec’s Vision for a Centralized Interim Storage Facility, INMM Spent Fuel Seminar, January 16, 2013. This October 25, 2012 Holtec press release introducing the HI-STORM CIS for Consolidated Interim Storage states: “In contrast to HI-STORM UMAX, the HI-STORM CIS vertical ventilated module stores two MPCs [Multi-Purpose Canisters] in a stacked configuration in each cavity; thus the required storage area is halved. A HI-STORM CIS ISFSI is so compact that only 14 acres of land is needed to store 4,000 canisters containing upwards of 50,000 tons of uranium. The same storage capacity will require 28 acres if HI-STORM UMAX were to be used instead. See Handout: Holtec Storage System Designed to Leak. Holtec does not mention any of storage system problems in their March 2, 2018 press release HI-STORE CIS in Southeastern New Mexico Edges Closer to Regulatory Approval. In the HI-STORE CIS drawing below, Holtec does not show the air vents in the lids (required for convection cooling of the fuel waste), giving the illusion of total burial of the fuel waste cans. However, a through-wall crack in the thin-wall canisters will result in radioactive gases escaping into the environment. Flooding, small critters and debris can enter through those air vents, yet there are no drains in the holes. What could possibly go wrong? Unfortunately, we cannot trust the NRC to protect our safety. The NRC renews licenses for thin-wall aging canister system facilities in spite of the inability to adequately inspect for cracks or repair cracks. See Calvert Cliff’s license renewal information. Holtec admitted to the NRC that if (unborated) water enters the canister a criticality can occur. The NRC confirmed this. However, they claim canisters won’t have through-wall cracks, so it won’t happen. They ignore the fact even microscopic scratches, pits or other corrosion, such as from moist salt air, can trigger cracking. They admit once a crack starts it can grow through the wall in only 16 years. Their original estimate it would take 30 years for a crack to start has been proven wrong. A 2-year old Diablo Canyon canister has all the conditions for cracking. The NRC admits moisture with salt is one of the major triggers for cracking of these stainless steel thin-wall canisters. They claims there is insufficient humidity at the Pacific Coast for moisture to dissolve marine salts on the thin-wall canisters. They ignore Pacific Coast weather conditions of frequent fog and on shore surf as shown in the photo below of San Onofre shrouded in fog. They ignore their own evidence of similar components at San Onofre having cracks and leaks from moist salt air. In the Spent Fuel Pool environment, the minimum critical volume necessary to sustain a nuclear chain reaction (criticality) may be as small as four fuel assemblies (ML16097A169). Most canisters contain 24 to 37 PWR fuel assemblies or 68 BWR fuel assemblies. See US Canister Inventory. There are no approved or adequate plans to deal with cracking or leaking canisters. Listen to this audio recording where this and other Holtec MPC canister issues are discussed at the 9/28/2017 Holtec and NRC public meeting. The thin-wall (1/2″ to 5/8″ thick) stainless steel canisters are vulnerable to short-term stress corrosion cracking. The below ground concrete structure (with air vent lids) only has a 10-year warranty from Holtec. The thin-wall steel canisters have a 25-year warranty that is void if the concrete structure fails after its 10 year warranty. Warranty is only for manufacturing defects — does not cover cracks from environmental conditions. Canisters with even partial cracks cannot be transported according to NRC Regulation 10 CFR § 71.85. The Koeberg nuclear plant had a similar container (a tank) leak in only 17 years. Koeberg cracks up to 0.61″ deep are thicker than existing Holtec canisters (0.50″). The NRC states both 304/304L and 316/316L stainless steels (SS) have the same vulnerabilities. The Koeberg tank was 304L SS. 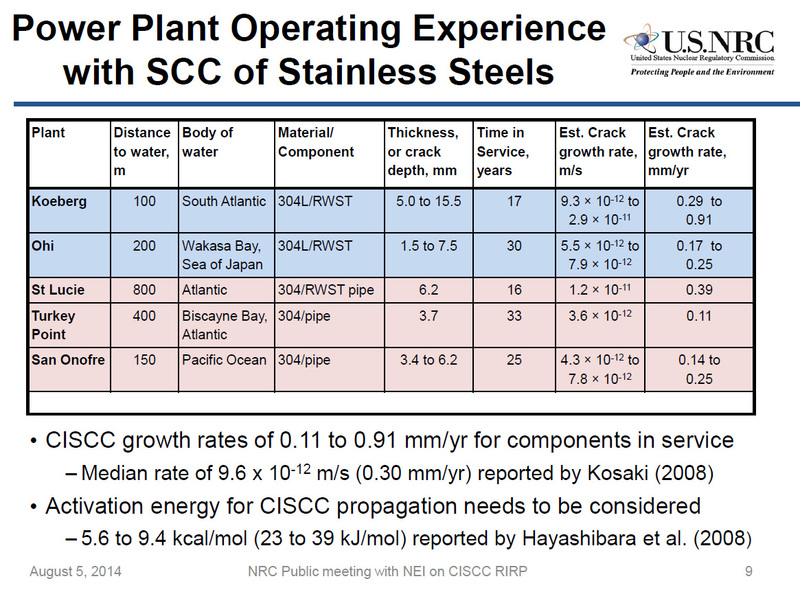 Holtec promised to use 0.625″ thick canisters at San Onofre. However, their NRC license is only approved for 0.50″ thick canisters. It’s not practical to repair a damaged canister, says Dr. Kris Singh, CEO, Holtec International. …you can easily isolate that canister in a cask that keeps it cool and basically you have provided the next confinement boundary, you’re not relying on the canister. So that is the practical way to deal with it and that’s the way we advocate for our clients. However, there are many problems with Dr. Singh’s solution of putting cracked and leaking canisters inside [transport] casks. There are no NRC approved Holtec specifications that address Dr. Singh’s solution of using the “Russian doll” approach of putting a cracked canister inside a [transport] cask. NRC requirements for transport casks require the interior canister to be intact for transport high burnup fuel. This NRC requirement provides some level of redundancy in case the outer cask fails. Does this mean this leaking canister can never safely be moved? Who will allow this to be transported through their communities? How stable is the fuel inside a cracked canister? What is the seismic rating of a cracked canister (even if it has not yet cracked all the way through)? The NRC has no seismic rating for a cracked canister, but plans to allow up to a 75% crack (IWB-3640). There is no existing technology that can currently inspect for corrosion or cracks. The NRC is allowing the nuclear industry 5 years to develop it. It is likely to be inadequate due to the requirement the canisters must be inspected while in the concrete overpacks. What is the cost for the transport casks that will be needed for storage? Will they be on-site? Where is this addressed? Transport casks are intended to be reusable because of their higher cost. How and where will they be stored and secured on-site? How will the leaking canisters be handled by the Department of Energy at the receiving end of the transport? The DOE currently requires fuel to be retrievable from the canister. Holtec obtained a license amendment to use the Holtec HI-STORM UMAX system in high seismic areas effective September 8, 2015. However, it’s not approved for any specific site, including San Onofre; that requires additional approvals, and they are only certified safe for 20 years. Any issues that may occur after 20 years are not considered by the NRC, even though they know they must last for decades and they do not have aging issues resolved. See more details below. Certified for only the initial 20 years. Any evaluation for conditions that may occur after this [such as cracking, inspection, aging management, fuel cladding failure from high burnup fuel] are outside the scope of this approval. “Long-term” [as referenced in the Holtec Safety Evaluation] is a general descriptive term that is not required to support any regulatory or technical evaluation, and thus is not required to be more formally defined. The UMAX system does not have drains. Water and other debris can enter through the air vents. The Final Safety Analysis specifications state hoses must be inserted in the air vents to remove water and other debris. See diagrams below. The UMAX system is unproven, significantly more costly and unlikely to have costs reimbursed from the Department of Energy, states Entergy VY (Vermont Yankee) in their rejection of the Holtec underground system. …therefore unlikely that the cost of a spent fuel storage system that is significantly more costly than another available alternative can be recovered from DOE. Entergy VY continues to believe that the HI-STORM 100U [UMAX] system not only would be significantly more difficult and substantially more expensive to install than the above-ground HI-STORM 100 system, but also carries significant schedule and cost risks associated with an unproven system. NRC documents provide data that indicate thin storage containers can leak 16 years after a crack initiates. The NRC claims fuel must be reloaded into new canisters every 100 years, unless there is a permanent repository. However, they have no technical basis to state these canisters will last 100 years, but they do have data that indicates a much sooner potential failure rate. None of the current U.S. thin-wall steel storage canisters are adequately designed for over 20 year storage and may start failing in as little as 17 to 20 years with through-wall cracks. Vendor claims of longer storage times are not supported by data. There is no aging management designed into these thin canisters. They cannot be inspected for cracks or repaired once loaded with spent nuclear fuel waste. The NRC lowers safety standards so the utilities can continue using them rather than requiring more robust containers. KCI(3) Potassium Chlorate (Potash) at all concentrations and at any temperature has severe risk of pitting and crevice corrosion of stainless steels (304/304L/316/316L). See Corrosion Resistance Table for details and other corrosion risks. 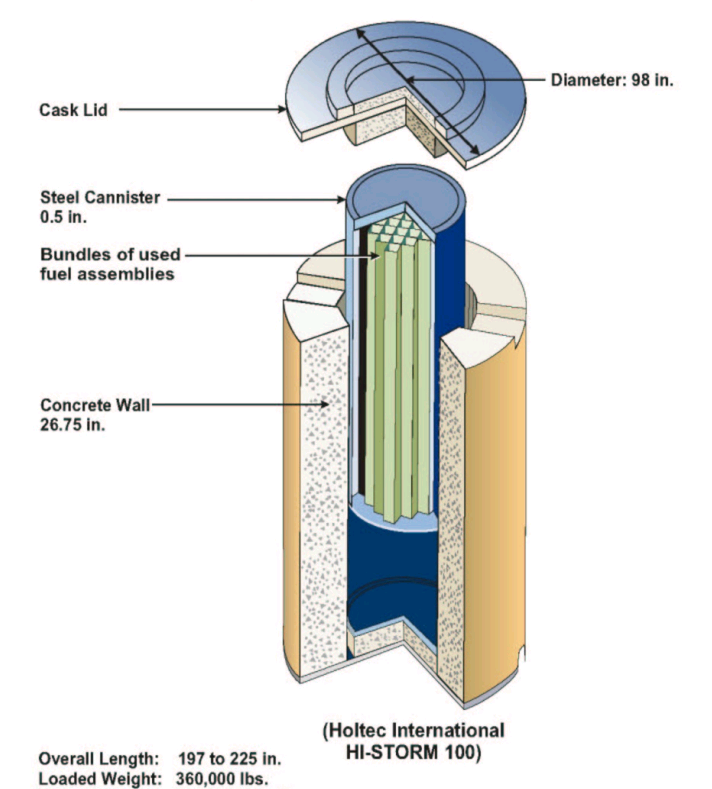 Starting in 2016, Holtec shipped thin-wall canisters with a new basket shim design to numerous nuclear waste storage facilities. Canisters arrived at San Onofre with loose bolts (shims) in the bottom of some canisters. Holtec had already loaded four canisters at San Onofre before they found a loose bolt. Holtec did not inspect the entire canister before loading the spent fuel assemblies, even though this is required by the San Onofre ISFSI license. This is an example of poor quality control in the loading of the canisters, poor design quality control and poor manufacturing quality control. More details on this issue on SanOnofreSafety.org home page. San Onofre’s ISFSI license, as with other facilities with spent fuel pools and ISFSI licenses, are required to be able to unload fuel from canisters back into the pool. Tom Palmisano, San Onofre Chief Nuclear Officer, admitted this is not possible to do with the four defective canisters, since they are too hot (200 to 300 degrees C) to unload back into the pool (water boils at 100 degrees C). He referred to this as a “reflooding” problem. This reflooding issue is well known throughout the nuclear industry and is a nationwide problem, yet the NRC continues to approve ISFSIs with the requirement to unload fuel assemblies back into the pool. This March 28, 2018 Loose Bolts email to NRC (David MacIntire) from Donna Gilmore asks the NRC to respond regarding this issue. The NRC responded to other issues raised, but as yet has not responded to this one. UMAX drawing is incorrect. UMAX has no drains. Also, this is the only thin-wall canister system that has no inlet air vent at the bottom. Drawing also doesn’t show air vent pipe that extend near the bottom of the hole. Water or other debris could block the bottom air vent pipe opening causing fuel to overheat. Attachment 1 to 5021022 – HI-2115090, Revision 2, “Final Safety Analysis Report On The Hi-Storm Umax Canister Storage System”. (630 page(s), 7/11/2014) ML14202A031 [pdf p. 241: MPC-37 dimensions: 213” (max length fuel) x 75.75” outside diameter, upper lid thickness 4.5”, lower lid thickness 4.5”, shell thickness 0.5”, baseplate thickness 3.0” [per Randall Granaas at SCE, length of MPC-37 at San Onofre is 201.5″]. For the storage configuration, each user of a HI-STORM FW MPC Storage System with a heat load equal to or greater than 30 kW shall perform a thermal validation test in which the user measures the total air mass flow rate through the cask system using direct measurements of air velocity in the inlet vents. The user shall then perform an analysis of the cask system with the taken measurements to demonstrate that the measurements validate the analytic methods described in Chapter 4 of the FSAR. The thermal validation test and analysis results shall be submitted in a letter report to the NRC pursuant to 10 CFR 72.4 within 180 days of the user’s loading of the first cask with a heat load equal to or greater than 30 kW. To satisfy condition 8 for casks of the same system type (i.e. HI-STORM FW casks), in lieu of additional submittals pursuant to 10 CFR 72.4, users may document in their 72.212 report a previously performed test and analysis submitted by letter report to the NRC that demonstrates validation of the analytic methods described in Chapter 4 of the FSAR. NRC approved a 20-year general license for the UMAX system April 6, 2015 for lower seismic risk areas. Comments submitted by San Onofre Safety and others regarding the Holtec UMAX. Underground systems are more likely to have overheating problems from wind affects than above ground cask systems. NRC management approved Holtec’s high burnup nuclear fuel waste transport cask by ignoring NRC engineers’ critical safety concerns, NRC’s own evidence, and NRC’s transport regulations. It’s obvious from these actions NRC management cannot be trusted to protect our safety — which is the main purpose for their existence. NRC Mission Statement: The NRC licenses and regulates the Nation’s civilian use of radioactive materials to protect public health and safety, promote the common defense and security, and protect the environment. Cracked canisters cannot be safely transported according to NRC regulations. The below NRC regulation and Technical Specifications from the Areva NUHOMS high burnup transport cask make this clear. In spite of this, the NRC approved the Holtec HI-STAR 190 Transport Cask using the Holtec Safety Analysis Report as their justification. Inspection for canister cracks or for canister content (damaged fuel, damaged fuel baskets) is not required before transport. The NRC knows there is no current technology that can inspect for cracks in canisters loaded with spent nuclear fuel, yet it approved this transport cask. The NRC knows Japan abolished use of aluminum alloy fuel baskets, yet does not require inspection of Holtec aluminum alloy (Metamic) fuel baskets. Baskets are needed to prevent a nuclear criticality “accident”. The NRC knows high burnup fuel assemblies can degrade after dry storage, yet does not require inspection of the fuel assemblies before transport. Unloading the canister at the destination location or elsewhere is not part of this Safety Analysis Report (SAR). Page 1.2-12 (Pdf page 32) states: Any further operations, such as unloading fuel assemblies from the MPC [Multi Purpose thin-wall canister] if that is required, and consideration of HBF [High Burnup Fuel] condition during unloading need to be performed under the jurisdiction of the location where the cask is unloaded, and is not part of this SAR. Holtec’s application for the New Mexico UMAX CIS facility states if a transport cask received at the NM UMAX CIS site arrives leaking radiation they will return to sender. They claim they will never need to unload fuel from canisters. Therefore, the issue of unloading a failing canister is not addressed at either the sender or receiving site. The Atlas rail car to transport the heavy transport casks requires 12 axles and is still in preliminary design. The thin-wall canister holding the spent nuclear fuel requires a reusable transport cask. Thick-wall storage casks do not need an additional transport cask, only temporary delimiters at each end for additional accident protection. Weights of US high burnup transport casks exceeds normal rail weight limits. The below DOE slide of Spent Fuel Transportation Casks lists some of those. The limit shown for the Holtec HI-STAR 190 transport cask is lower than that shown on Holtec technical specifications. DOE slide 13 Schwab, Jan 2018 Note: HI-STAR 190 has loaded weight of 450,000 lbs (not 414,269 as indicated in slide above). Holtec’s original application to the NRC for the HI-STAR 190 transport cask on August 7, 2015 (ML15219A582). This requires high burnup fuel and canisters to be intact prior to shipping in the transport cask. Holtec has no method to verify either condition. Holtec HI-STAR 190 Transport system is heavier than all other transport cask systems with bounding loaded weight of 450,000 lbs (225 US tons, 204 metric tons). Enclosure 2 to Holtec Letter 5024006, Response to Request for Additional Information, Holtec International, Docket No. 71-9373, HI-STAR 190 Transportation Package, August 30, 2016 (ML16238A214). Thick wall bolted-lid casks storage cask (unlike thin-wall canisters) are used for both storage and transport, so don’t require an additional transport cask and weigh much less. For example, the Castor ductile cast iron cask (with 19.75″ thick walls), loaded weight (with delimiters) is 275,600 lbs (137.8 US tons, 125 metric tons), meeting current US transport weight limits. All above weights exclude weight of the railcar. Loaded US railcar maximum weight in the US is 286,000 lb (143 US tons, 130 metric tons) for 4 axle cars (see BSNF map of routes for this weight). The proposed DOE Areva Atlas rail car is 12 axles. Holtec, the DOE and NRC have avoided addressing the feasible transport routes. Given the poor condition of our road and rail infrastructure and bridges, transport issues should be address before selecting a new location for the spent nuclear fuel. Current NWPA law requires transport issues be resolved before selecting a storage site. H.R. 3053 proposes to eliminate that requirement. This means a consolidated interim storage site could be built, even if never used. The Western Governors’ Association Policy Resolution 2017-05 Storage and Disposal of Radioactive Waste and Spent Nuclear Fuel states: transportation and logistical considerations should not be an afterthought to the siting process. The DOE originally proposed an 8 axles rail car, but that did not work in testing (Atlas Railcar Phase 1 Final Report Report No. : DE-NE0008390, October 28, 2016). Now they propose a 12 axles rail car, similar in many ways to the 12 axles car used for the Navy M-290 transport cask. The Navy M-290 transport cask weighs 260 tons, yet holds only about 1/10th the amount of spent nuclear fuel that commercial spent fuel canisters hold. The Navy transport spent fuel is very different than proposed US commercial spent fuel transport. Transport is to only one specific route (see map below). Navy uses a different containment system. Each container holds 1/10th of what is planned for each commercial spent fuel container. Only 850 total containers ship since March 1957. Transport statistics are confidential. Chapter 2 – Materials Evaluation, NRC RAI 2-1: Justify the adequacy of the proposed sampling process using MIL-STD-105 for reasonably demonstrating that MPCs [thin-wall canisters], with degraded conditions exceeding surface defects equal to or greater than 2mm depth, will be identified prior to transport. In response to RAI 2-8, dated April 8, 2016, the applicant stated that the MPC enclosure vessel shell shall undergo a surface defect inspection prior to shipment to ensure that existing defects and flaws do not develop into cracks during hypothetical accident conditions of transport. The applicant further stated that this inspection may be conducted on the population of MPCs at an Independent Spent Fuel Storage Installation (ISFSI) using a statistical testing approach suggested in Military Standard MIL-STD-105E (1989) titled “Sampling Procedures and Tables for Inspection by Attributes”. The applicant clarified that not every MPC at a given ISFSI requires inspection. However, the applicant did not provide a basis for the adequacy of the proposed standard guide for reasonably demonstrating that MPCs, with degraded conditions exceeding the proposed acceptance criteria, are adequately identified prior to transport. This information is required to determine compliance with 10 CFR 71.71 and 71.73. Chapter 7 – Package Operations, NRC RAI 7-1: Revise Chapter 7, “Package Operations”, of the application to clarify that the user must confirm that the analyzed configuration of stored high burnup fuel [HBF] has been maintained throughout the renewed storage period of the MPC prior to transport in the Model No. HI-STAR 190 package. The application assumes that the configuration of HBF stored in an MPC during a renewed storage period (i.e. 20-60 years) has been maintained. Although age-related degradation of the fuel is not expected to compromise the configuration of the fuel during the renewed storage period, an Aging Management Program (AMP) is expected to be in place for providing confirmation to this effect (refer to Appendices B and D in NUREG-1927, Rev. 1). Therefore, prior to transport in the Model No. HI-STAR 190 package, the user would be expected to confirm that the general licensee implementing the approved HBF AMP has not concluded that the analyzed configuration has been compromised during the renewed period of dry storage. This information is required to determine compliance with 10 CFR 71.55(e), 71.73 and 71.85(a). Bounding loaded weight 450,000 lbs [NOTE: higher than all other spent nuclear fuel assembly transport casks]. 1. Revise the application to provide acceptance criteria for the MPC enclosure vessel integrity, which clearly defines allowable degraded conditions prior to transport. The acceptance criteria should demonstrate MPC containment integrity during hypothetical accident conditions. 2. Discuss methods (e.g. transport inspections) used to ensure that the MPC meets the proposed acceptance criteria. The application (Section 8.2.1, “Structural and Pressure Tests”) states that the MPC maintenance program shall include an Aging Management Program (AMP) (under a 10 CFR Part 72 license) that verifies that the MPC pressure and/or containment boundary is free of cracks, pinholes, uncontrolled voids or other defects that could significantly reduce the effectiveness of the packaging. However, the application does not define acceptance criteria for other credible degraded conditions (e.g. loss of material due to localized corrosion pits, etching, crevice corrosion; presence of corrosion products) that ensures that cracks will not develop during transport, which could compromise the validity of the leak-tightness criterion during transport. The structural evaluation of the HI-STAR 190 package does not consider potential degraded conditions of the MPC during dry storage under a Part 72 license. Therefore, the application should describe the methods used to ensure that the acceptance criteria for the MPC enclosure vessel integrity are met. This could include pre- and post transport inspections that ensure that the safety analyses remain valid and the MPC is free of cracks, pinholes, uncontrolled voids, or other defects that could compromise the enclosure vessel integrity. The staff notes that sole reliance on a Part 72 AMP is an overly-simplistic and inadequate approach, as the AMP may identify certain aging effects that the Part 72 licensee deems acceptable for continued storage following review under its corrective action program (CAP), but which could potentially compromise the MPC containment integrity during hypothetical accident conditions (HAC). For example, the acceptance criteria in the AMP for localized corrosion and stress corrosion cracking included in Appendix B of draft NUREG-1927, Rev. 1 (ML15180A011) states that any indications of localized corrosion pits, etching, crevice corrosion, stress corrosion cracking, red-orange colored corrosion products require additional examination and disposition under the Part 72 licensee’s CAP. During the CAP review, the Part 72 licensee may use data from non-destructive examination and other analyses to support the conclusion that a given aging effect (e.g. loss of material due to localized corrosion pits, etching, crevice corrosion; presence of corrosion products) will not compromise the confinement function of the MPC for the expected loads during normal, off-normal and accident conditions of storage. Those loads, however, are not expected to be commensurate with HAC transport loads. Therefore, reliance on a 10 CFR Part 72 AMP to assure compliance with the HI-STAR 190 structural safety analyses is inadequate. This information is required to determine compliance with 10 CFR 71.55(e), 71.73 and 71.85(a). • MPC’s containing high burn-up fuel and stored beyond the duration of the initial 20 year license period under the provisions of 10CFR 72 shall undergo an MPC enclosure vessel shell surface defect inspection prior to shipment to ensure that existing defects and flaws do not develop into cracks during hypothetical accident conditions of transport. • The MPC shall be subject to an Eddy current testing (ECT) regimen that is capable of identifying any surface defect equal or greater than 2 mm deep anywhere on the external cylindrical surface of the enclosure vessel. • This test may be conducted on the population of MPCs at an ISFSI using a statistical testing approach suggested in Military Standard MIL-STD-105E (1989) titled “Sampling Procedures and Tables for Inspection by Attributes”. Not every MPC at a given ISFSI requires inspection. • Any flaw that exceed 2 mm in depth will disqualify the canister for transport until further investigation is performed and the NRC accepts, under the exemption process or other appropriate licensing action, the owner-provided evidence that the affected canister will survive a HAC. Inasmuch as the ECT is considered the most definitive detector of cracks, pits and other types of surface flaws and is universally relied upon for detecting minute degradation in the tubing of critical nuclear plant heat transfer equipment such as Steam Generators, we propose to use this proven technology to determine the structural integrity status of the MPC’s. We believe the above commitments provide a robust means to ensure that only those MPCs that have a structurally competent containment boundary to meet the transport accident of §71.73 will be transported in HI-STAR 190. NRC’s Expert Panel Workshop on Degradation of Concrete in Spent Nuclear Fuel Dry Cask Storage Systems, February 24-25, 2015, identified numerous concrete aging management problems, particularly with below ground systems (such as the Holtec UMAX dry storage system) due to limited inspection capability, ground moisture and chemical reactions with concrete. Concrete is not an issue in thick steel or ductile cast iron casks, since they don’t use concrete for gamma and neutron shielding. U.S. Utilities choose inferior steel/concrete canister designs due to cost even though even short-term costs will be higher with thin-wall canister systems. The vendors informed the committee that cost is the chief consideration for their customers when making purchasing decisions. Cost considerations are driving the cask industry away from all-metal [thick] cask designs and toward [steel/]concrete designs for storage. National Research Council of the National Academies (2006), Safety and Security of Commercial Spent Nuclear Fuel Storage, National Academies Press, Washington D.C., page 63. Cost-based case testimony and evidence (legal briefs) submitted to the California Public Utilities Commission (CPUC) by intervener Donna Gilmore and David Peffer. Judge Bushey ruled them “out of scope” even though the CPUC has regulatory authority over costs and even though she stated these were meritorious issues. The Nuclear Regulatory Commission regulates safety, not costs, so the CPUC is abdicating their responsibilities to the ratepayers on this issue.The Governor appointed CPUC Commissioners approved SCE’s Decommissioning plan in spite of evidence showing there are insufficient San Onofre Decommissioning Trust Funds, based on SCE’s Decommissioning Plan. SCE’s plan is based on unsubstantiated assumptions that nothing will go wrong and the federal government will remove the spent nuclear fuel waste in the short-term. Commissioner Florio set the scope of the hearing to exclude decisions about the dry storage system. However, the CPUC has the authority to require a cost/benefit analysis of this capital project and require they present additional options in that cost/benefit analysis. The staff realizes that the applicant does not have experimental data obtained from a geometry that resembles the HI-STORM UMAX design. Unless the applicant can provide such validation in advance, the staff will issue the CoC at 80% of the total heat load being requested in the application. The staff determined that 20% reduction in the total decay heat will compensate for the uncertainties in the calculations and lack of experimental data to validate the analysis. In cases where data has become available, the staff has found that errors as large as 25% were associated with analytical results. The 20% reduction combined with the available margin in the vendor’s result would provide adequate justification for the thermal design. Once a cask is loaded to 80% of the design basis heat load, the applicant could perform the proposed test to obtain the necessary data which could be used to validate the analysis. At that point the applicant could amend the CoC for higher heat loads. These issues were discussed in an August 28, 2013, conference call with Holtec. The applicant’s initial response to RAI 6-1, although very detailed, was insufficent to form a safety finding for the HI STORM UMAX storage system due to the potential for water to challenge the integrity of the MPC during a flood event and other credible sources. Additionally, the staff finds that Holtec has not provided acceptable contingency actions to address removing water from the CEC after incursion. The essential design and operational features of the HI-STORM UMAX System are:… d. Removal of water from the bottom of the storage cavity can be carried out by the simple expedient use of a flexible hose inserted through the air inlet or outlet passageways. In the HI-TRAC transfer cask, the primary gamma shielding is provided by lead. As in the storage overpack, carbon steel supplements the lead gamma shielding of the HI-TRAC transfer cask. In the MPC, the gamma shielding is provided by its stainless steel enclosure vessel (including a thick lid); and its aluminum based fuel basket and aluminum alloy basket shims. Japan abolished use of aluminum baskets, but NRC and thin-canister vendors have not addressed this issue. Holtec and other dry storage vendors also use aluminum baskets. However, the NRC, vendors and Southern California Edison have not addressed this issue. Unlike Japan and most other countries that have standardized on thick wall bolted lid casks, the majority of U.S. canisters are thin-wall and have welded lids. The only method to inspect the interior of the thin-wall canisters is to destroy these million dollar canisters. The NRC has continued to approved these thin-wall canisters that cannot even be inspected (inside or out), even though they know about the issues with the aluminum baskets. The HI-STORE system planned for New Mexico plans to double stack canisters in the Holtec holes in the ground. Diablo Canyon, Issuance of Materials License SNM-2511 for Diablo Canyon ISFSI (ML040780107), released July 13, 2005 contains links to technical specifications for Diablo Canyon’s HI-STORM 100 spent fuel storage system installation. Diablo Canyon NRC Event Notice #51134, not meeting technical specifications due to incorrect loading of casks, June 6, 2015: 17 of the 29 loaded casks in the Diablo Canyon ISFSI prior to the 2015 campaign were found to be out of compliance with ISFSI Technical Specification 2.1.2, Uniform and Preferential Fuel Loading. The casks were preferentially loaded based on heat load vs cooling time. On June 6, 2015, during a review of Independent Spent Fuel Storage (ISFSI) cask loading, plant personnel discovered that for two casks, preferential loading was not used during uniform loading as required by ISFSI Technical Specification 2.1.2, Uniform and Preferential Fuel Loading. “ISFSI Technical Specification 2.1.22 [ML040780229] requires that a preferential fuel loading configuration (i.e., that fuel assemblies with the longest cooling times shall be loaded into peripheral fuel storage locations) is used during uniform loading. 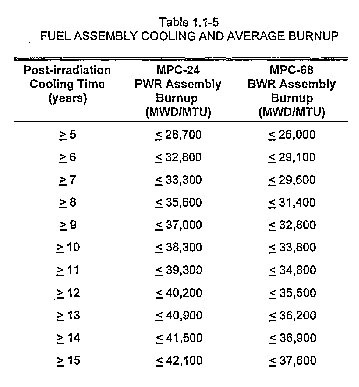 [Fuel assemblies with shorter post-irradiation cooling times shall be placed toward the center of the basket.] Preferential loading was only partially met for two casks, designated MPC-253 and MPC-257. For these two casks, fuel assemblies with the longest cooling times were placed in the four center cask locations, which are only ones allowed for those assemblies containing control rods. Approved Holtec loading pattern requires longer cooling times for 20 fuel assemblies (Region 2). Only 12 shorter cooled fuel assemblies can be loaded (Region 1) in canister. Would Diablo Canyon have been able to keep operating if they had loaded the fuel correctly in the canisters? Holtec Awarded Contract for Supply of Dual-Purpose Metal Casks for Koeberg Nuclear Power Station in South Africa [HI-STAR 100]. South African power utility Eskom is to pay an estimated ZAR200m ($15.6m) for seven new storage casks to keep its Koeberg nuclear plant running beyond 2018. The HI-STAR 100 is different than the majority of Holtec storage systems used in the U.S. It uses thin canisters, but stores them inside thick metal bolted-lid storage/transport casks designed for lower burnup fuel and requiring longer cooling times. The HI-STAR 100 allows 32-fuel assemblies (MPC-32). However, MPC-32’s are not allowed for damaged fuel assemblies. Holtec Safety Analysis Report HI-STAR 1000 Cask System, NRC Transport Docket 71-9261, October 11. 2010, Rev. 15. The HI-STAR 100 has only been licensed since October 1999. Humboldt Bay uses 5 HI-STAR 100HB casks for their 390 low burnup fuel assemblies, 95 of which are damaged. Each damaged assembly is placed in damaged fuel container [can]. In October 2010, TVA debarred Holtec International, Inc., based on the results of a criminal investigation. On or about February 7, 2002, Symonds knew that USTD had been directed to send that $29,212.77 check to Krohn by Holtec International (Holtec) – a company that Symonds knew as of that time (1) had contracted with TVA in November 2001 to design and construct a dry cask storage system for spent nuclear fuel rods at TVA BFN and (2) had contracted with USTB to fabricate some of the construction materials for the TVA BFN dry cask storage system. Additionally, on or about February 27, 2002, during the reporting period for his October 21, 2002 OGE Form 450-A, Symonds co-owned Krohn Enterprises, LLC with his former spouse, and on or about February 27, 2002, Krohn Enterprises, LLC, was paid $25,000 by Check No. 31970 drawn on the Mellon Bank account of USTD. That $25,000 check was deposited into the Krohn Enterprises, LLC, Heritage Bank account, and the proceeds of that check were used to pay the personal expenses of Symonds and his former spouse. On or about February 27, 2002, Symonds knew that USTB had been directed to send that $25,000 check to Krohn by Holtec – a company that Symonds knew as of that time (1) had contracted with TVA in November 2001 to design and construct a dry cask storage system for spent nuclear fuel rods at TVA BFN and (2) had contracted with USTB to fabricate some of the construction materials for theTVA BFN dry cask storage system. Case 12. The defendant was employed as a manager at the Tennessee Valley Authority’s Brown’s Ferry Nuclear Plant (TVA-BFN). He was required to complete and submit to TVA a Confidential Financial Disclosure Report, an OGE Form 450. He was required to submit an updated form annually. He was permitted to submit an OGE Form 450-A if there was no change in any of the information he had reported on the prior year’s form.On the form he submitted in November 2000, he answered “none” to the question that asked him to identify for himself and his spouse (1) any asset with a fair market value greater than $1,000 at the close of the reporting period or which produced income over $200 and (2) any non-Federal source of earned income such as salaries and fees over $200 during the reporting period. He certified that his statements were “true, complete, and correct to the best of [his] knowledge.”In October 2001 and October 2002 he submitted the OGE Form 450-A. On both forms he certified that there were no new reportable assets or sources of income for himself or his spouse and that neither he nor his spouse had any new reportable sources of income from non-Federal employment.Despite these certifications, in February 2002, during the reporting period for the October 2002 OGE Form 450-A, he co-owned Company D with his former spouse. Company Z issued 2 checks to Company D, one in the amount of $29,212.77 and the second in the amount of $25,000. The checks were deposited into Company D’s bank account and the proceeds of the checks were used to pay the personal expenses of the defendant and his former spouse. The defendant knew that Company Z had been directed to send the check to Company D by Company E. The defendant knew that Company E had contracted with the TVA in November 2001 to design and construct a dry cask storage system for spent nuclear fuel rods at TVA-BFN and had contracted with Company Z to fabricate some of the construction materials for the TVA-BFN dry cask storage system.The defendant knowingly and willfully failed to disclose on his confidential financial disclosure report that he had received, through Company D, either check.The defendant pleaded guilty to violating 18 U.S.C. § 1001, making a false material statement by executing and submitting an OGE Form 450-A on which he knowingly and willfully failed to disclose his receipt of $54,212.77 through Company D. He was sentenced to 2 years’ probation and a $5,000 fine.The Eastern District of Tennessee handled the prosecution. Debarments – In 2010, TVA and the OIG worked collaboratively to develop a suspension and debarment process for contractors that defraud TVA. That same year, Holtec International, Inc. (Holtec), a dry cask storage system supplier for TVA nuclear plants, became the first contractor to be debarred in TVA history. Holtec’s debarment lasted sixty days. Also, Holtec agreed to pay a $2 million administrative fee and submit to a year-long monitoring program for its operations. The OIG initiated a first in TVA history; the debarment of a contractor doing business with TVA. In October 2010, TVA debarred Holtec International, Inc., based on the results of a criminal investigation conducted by the OIG. Because of our recommendation, TVA created a formal suspension and debarment process and proceeded to debar Holtec for 60 days. Holtec agreed to pay a $2 million administrative fee and submit to independent monitoring of its operations for one year. The TVA Board’s Audit, Risk, and Regulation Committee and TVA management fully supported the OIG’s recommendation to create a suspension and debarment process and submit Holtec to that process. TVA’s Supply Chain organization and Office of General Counsel worked collaboratively with the OIG to achieve this milestone in TVA history. The OIG previously reported that a TVA technical contract manager received money from a TVA contractor. Criminal actions were taken against the former TVA technical contract manager in that investigation. In addition, a report of administrative inquiry was issued to TVA management regarding the actions of the contractor, Holtec International, Inc. In response to this report, TVA established and filled the position of a TVA suspension and debarment officer to review the matter, which led to the first debarment action at TVA. Holtec International, Inc., received a sixty-day debarment (October 12 through December 12, 2010); and, by agreement with TVA, will pay a $2 million administrative fee to TVA; appoint a corporate governance officer and an independent monitor (at the contractor’s expense); implement a code of conduct, to include training for all employees, executives, directors, and officers; add three noncompany members to its board of directors and sign an administrative agreement ensuring compliance to the above terms. Reports of Holtec quality control issues brings in to questions how reliable these casks will be over time. Oscar Shirani alleges that all existing Holtec casks, some of which are already loaded with highly radioactive waste, as well as the casks under construction now , still flagrantly violate engineering codes (such as those of the American Society of Mechanical Engineers [ASME] and American National Standards Institute [ANSI]), as well as NRC regulations. He concludes that the Holtec casks are “nothing but garbage cans” if they are not made in accordance with government specifications. Although NRC has dismissed Shirani’s concerns, NRC Region III (Chicago office) dry cask inspector Ross Landsman refused to sign and approve the NRC’s resolution of Shirani’s concerns, concluding that this same kind of thinking led to NASA’s Space Shuttle disasters. He stated in September 2003, “Holtec, as far as I’m concerned, has a non-effective QA program, and U.S. Tool & Die has no QA program whatsoever.” Landsman added that NRC’s Nuclear Reactor Regulation division did a poor follow-up on the significant issues identified, and prematurely closed them. Your Holtec page: In the Spent Fuel Pool environment, the minimum critical volume necessary to sustain a nuclear chain reaction (criticality) may be as small as four fuel assemblies (ML16097A169). Most canisters contain 24 to 37 PWR fuel assemblies or 68 BWR fuel assemblies. See US Canister Inventory. Are you mixing apples & oranges by suggesting assemblies in canisters could go critical as in SFP? Don’t want your analysis to be undermined if such is the case. Mulligan is repeating one of those industry myths. He may not know any better. I have documents from Holtec and NRC that confirm the fuel will go critical in dry storage if unborated water enters canisters through cracks. The NRC approves them based on the assumption there will never be through-wall cracks. Also, the technical specs state one of the purposes of the canister basket and basket shims is to prevent criticalities. Ask him for his technical references.